I suggest two metaphors for addressing the issue, one reflecting the problem and the other the solution. 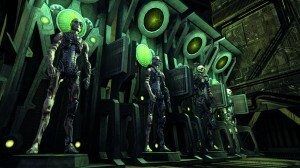 In Star Trek: The Next Generation (1987-1994), the Federation encountered technology dependent beings known as the Borg. 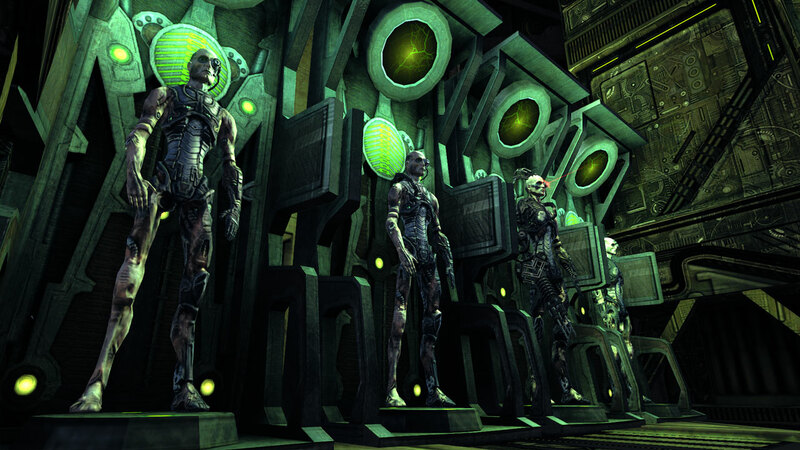 They were organic-machine hybrids (cyborgs, hence the name) who lacked individuality and “assimilated” all species with which they came into contact. They were dependent on technology for their sustenance and identity. Granted, our students are not cyborgs; but many of their lives, intellectually and socially, are defined by technology. In the extreme, the user becomes the used and the consumer becomes the consumed. 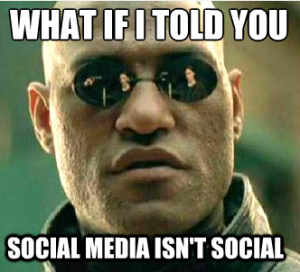 Too many believe the myth that “social media” are social. In fact, many of them lead relationally impoverished lives, awash in a sea of personal information, their own and others’, yet profoundly beset by loneliness. We, their professors, can give them the tools rectify that. Rather than reject technology altogether, we have the opportunity to guide students in using it with greater moderation. We have the power to help them perceive that reality lies beyond the limits of their technologically defined worlds. This was the role of Morpheus in The Matrix (1999). He guided Neo to unplug, to see reality, and to plug in again, using his new insight to liberate others. In practical terms, helping our students unplug involves planning class time and assignments that require non-technological forms of participation. Classrooms have the potential to be communities rich with interpersonal interaction. Whether in small groups or as a whole class, we can give each other the gift of unhurried time, unmediated by technological devices. Having a ban on laptops helps. I encourage my students that taking notes by hand makes them easier to remember; recent studies have supported this: “a study carried out by Professor Virginia Berniger at the University of Washington found that handwriting activated more of the brain than keyboard writing, including areas responsible for thinking and memory” (http://moreintelligentlife.com/node/4965). Fully in the moment, we have the freedom to discuss the texts and ideas at hand. Outside of class, there are even clearer options. I assign a combination of reflection papers and papers integrating personal reflection with analysis of primary texts. Such assignments make plagiarism especially sad (and easy to catch), since they require students to produce what they cannot find online: their own response to the ideas of others. Students know where to dig for information; there is plenty of that on the internet. They need to learn where to dig for their own insights. For research papers in upper-level courses, I recommend two rounds of drafts: a first draft, using only online sources; and a final draft, using only traditional sources and including a summary critique of how the traditional sources differed from those available online. The above suggestions most directly apply to the humanities, fields concerned, by definition, with what makes us authentically and more fully human. I have no answers for fields that are more information-driven. But I know that the de-technologizing and moderated re-technologizing of our students is urgent for the humanists among us, integral to the case we must make for our own continued relevance. Great thoughts! A chief dilemma in education today is how we help people think. There has been so much “teaching to the test” and “cut-and-paste” investigation, that many students lack the skills necessary to process information and respond to/interact with it intelligently, whether verbally or with the written word. Technological advances, while giving us amazing abilities – including the opportunity to discuss this in such a forum – also make it more challenging for the educator to provide this aspect of essential human development. This, in turn, requires the educator to go the extra mile in thinking through assignments and methods of evaluation. And this is not simply a USA issue – it’s what I’m encountering in Mexico. Educational systems aimed at being prepared for the test + new technology = people with limited skill sets for using creativity to counter real world problems. I like the idea of assigning all digital sources vs. all traditional sources. Contrast is a great tool!! I teach a class that is fundamentally about people and behavior but our medium is technology. I teach my students how to sketch their ideas, and we frequently don’t touch a computer until the final week of an assignment. Is it professionally practical for them to leave class with a big pile of sketches? No. But it teaches them how to think, how to craft a narrative, and how to share ideas in the “real” world. Aren’t blog comments great? In relation to your post above, I have to disagree with the statement, “it does virtually nothing to enhance character development.” Ehhhh, not so much. Learning how to properly navigate the internet, technology, and social media can be quite character enhancing. I think teaching students how to effectively use technology is really important. As a parent, I have to think about this often. Our generation actually remembers a time before the internet but our children will not. This means we will have to teach them things during their childhood that we did not have to learn, so both the parent and child are in uncharted territories. I am now getting completely off the original point I made above but I’m on partial bed-rest and bored, so indulge me. As you know, I blog about my life and my family. Many bloggers who blog about their families will stop blogging specifically about their children when they turn five. They pick this age because it is traditionally the age children start school and they want to stop creating an online record of their kids that is written by them, the parent. They realize that someday the digital record of “Charlie pooped his pants today” or “Charlie likes to sleep with a pink binkie” or ” Charlie has a huge crush on Samantha” may still be around when they are applying for a job, or running for political office, for example. So starting at five, they allow the children to take control of that online digital record. Sure, the kid may not start up their own blog at five years old, but they basically hand over the reigns for when the child does start to make their own digital imprint. All this to say, that it is at that point, when the child is ready to start leaving a lasting digital imprint, that they need guidance from parents and teachers on how to most effectively do that. I know, rambling from what you are talking about, but hey, it’s a blog comment! Would you agree that it is not technology on its own which is “character enhancing,” but rather something else: the choices that students themselves make and the guidance that educators of all stripes provide? I think of time online like time in Vegas. I might have a character building experience as a result, but it might be in spite of Vegas, rather than because of Vegas. Is that fair? I fear we run the danger, in our teaching and in institutions allocation of resources, of pursuing all things new and shiny, to the point of myopia. Technology helps us access information more readily and interact with others in ways that we might not be able to; but learning how to interact others is best mastered away from a screen. We must not confuse access to information with the acquisition of skills, knowledge, or wisdom. Technology provides opportunities, but we must provide students the means for discerning how to navigate those opportunities.